The adventures of a shark scientist and his mission to change our perception of New Zealand’s most feared and misunderstood predator. Riley Elliott is a surfer, spear-fisherman and shark scientist from the Waikato, currently writing a PhD at Auckland University. He’s also on a mission to share his fascination with sharks, raise the profile of their dwindling numbers and question the legitimacy of shark-finning in our waters. Riley’s passion for sharks started while he was working at the Oceans Research Great White Shark Station in South Africa, where he learned to free-dive with sharks beyond the cage. Upon his return to New Zealand, Riley began research for his PhD, and in the process uncovered some alarming trends. Riley Elliott is making it his mission to educate New Zealanders about the over-exploitation of sharks in our waters, particularly the controversial practice of shark-finning, and how it affects the ocean ecosystem. In the process he’s becoming New Zealand’s most popular expert on shark species, and a go-to commentator about our increasing encounters with this deadly ocean predator. 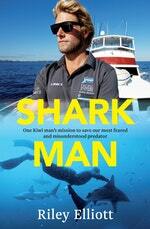 Shark Man is Riley’s story, from his time learning to scuba dive and spearfish,his early fascination with sharks while surfing life at Raglan, his first encounters with great whites in South Africa and learning to safely free-dive to his study of New Zealand sharks species and the making of the TVNZ television documentary series ‘Shark Man’. The book also has information about New Zealand’s prevalent shark species – where they live, how they hunt, and their interaction with humans, with fascinating new insights and little-known facts. Love Shark Man? Subscribe to Read More to find out about similar books.